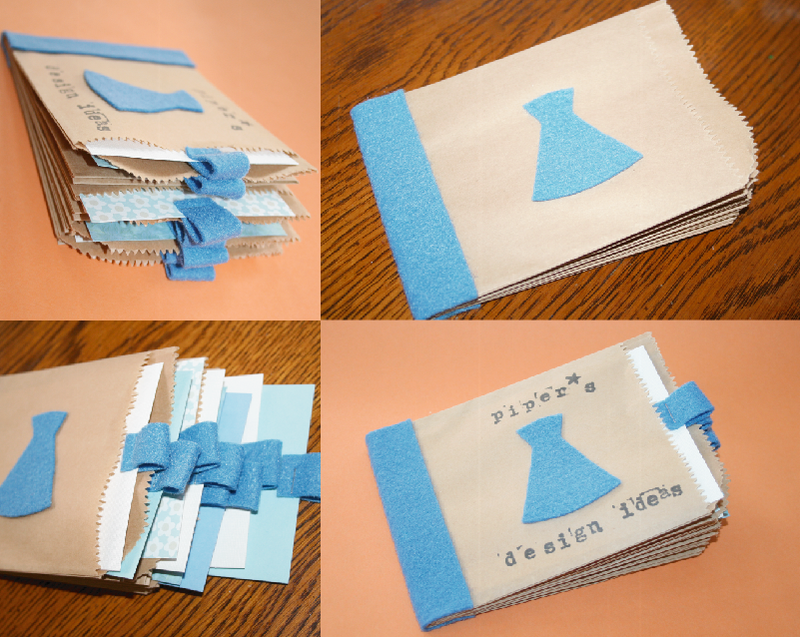 Did you know you can make a really cool book from flat paper bags? The finished product is super cute and has lots of room to personalize any way you like, as well as fun pockets you can tuck note cards, photos, keepsakes, etc. into. 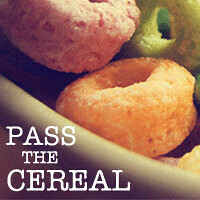 I originally spotted this idea here and I love Melissa, her blog, and her amazingly crafty kids. I hope as my kids grow up they still like to craft with me too! 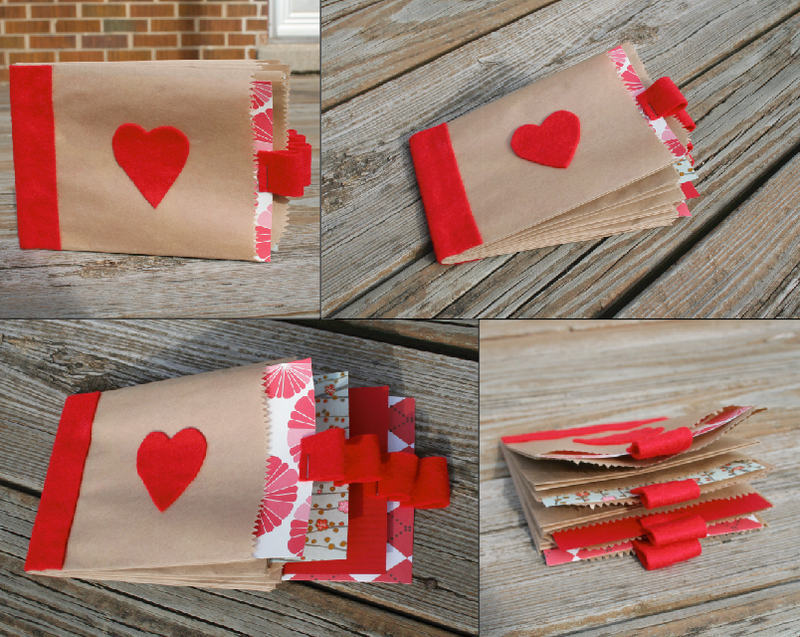 Anyway, they created this paper bag book as a Valentine for her daughter's friend, but I have already used them a couple different ways (and have been dreaming up more possibilities too!). And the best part is that they are relatively simple to make. So simple, that I created a little photo tutorial of my own as I created my first paper bag book. 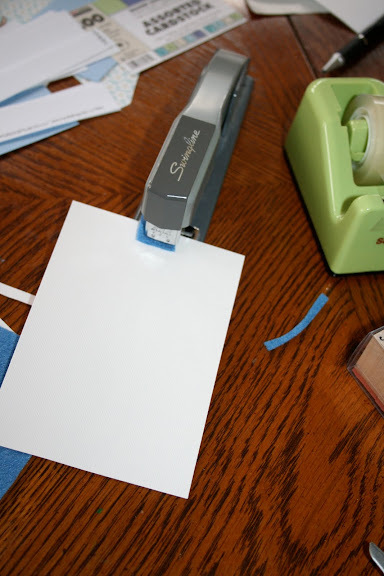 The materials you need: 4 flat paper bags, bone folder (or really anything you can use to crease the folds well), double-sided tape, stapler, felt, card stock, paper cutter, scissors, craft glue, rubber stamps (or whatever you want to use to embellish your book). Take a bag (mine are 8.5 x 11") and lay it on your work surface as shown above. Fold the bag from top to bottom (fold in half the long way so the front of the bag is showing). Then fold the bag from left to right, so the bottom of the bag is on top. Repeat this with a second bag. Fold the remaining two in a slightly different way. Start with your bag front down, as you did before, and do the same fold top to bottom. Then turn the bag over (left to right) so the top/opening of the bag is on the left. Then fold the bag from left to right, so the top of the bag is on top (shown on the bags on the left of the photo). Once you have the folds made (and creased with the bone folder), open up each bag and put double-sided tape along the bottom & bottom side edges so that when you fold it in half again, the edges are sealed together. Line the bags up staggered every other one, as shown above. If you've done it correctly, the top of your book will be the folded edges and the bottom will be the taped edges. Tuck the 4 book pages together tightly, fold and staple the edge to create your spine. My stapler was a little touchy with the thickness, so I stapled it from both the front and the back to secure. Cut a piece of felt to cover the spine 2 x 4.25" (height of album). Cut another piece into whatever shape you'd like for the cover of the book. For this book, I made a basic dress shape. Glue the felt pieces to the book and let dry. I used tacky glue/craft glue and it worked fine and dried quickly. Cut pieces of card stock 5.25 x 4"to fit into the pockets of the book. There are 8 pockets and for this book, I decided to fill all 8 with paper. I took the photo above to get an idea of how big the felt loops were (please ignore the extra fancy ruler I was using) as I didn't originally measure them. So I'd say to cut a 3/4" wide x 2-3" tall piece of felt for each card insert you are using. Fold the felt into a loop and staple on the short end of the card. For this book, I used different colored papers (mostly solids) to make the book more interesting. Almost done, but first I had to give my book a title. Unfortunately, I've never really been a rubber stamper, so my lack of experience led to my cover ending up not so pretty. It kind of made me sad that I messed up the book as I really liked the rest of it! This book was given to a super cool girl I know as part of her birthday present. It was all fashion designer themed, so I made this book as a sketchbook/notebook for her to use as she came up with ideas. It's small size makes it easy to carry around, but the interior pages and the pull-out cards give it has tons of space inside, making it the perfect fit for the job! The second book I made is still in progress. The book is completed, but the pages of this one need to be filled with ideas, sketches and love before it is given! Next week is teacher appreciation week and this book is heading to Jack's amazing teacher (don't tell her, okay?). Each of the 4 card inserts I included will hold a gift card and Jack will fill the other pockets and pages with whatever he desires. I hope she likes it as much as I do! i am so glad we are not in your class this year...your ideas are so much better than mine...I am SO jealous! very very very cute and I am SURE she'll love it! i super love! but for some reason seems too hard for me ... i need a video slo-mo tutorial! and piper loved it!!! thank you! Holy cow Heather, that is super cute! You would have made a much better room parent than I am! your going to make my Giving Tree look like...uhhh...curses. i think she should feel loved this week. hopefully everyone has rolled out their love!